ﺗﺮیگﺮ )ﺑﻪ ﺍﻧگﻠیﺴی: ) Trigger کﻪ ﺩﺭ ﻟﻐﺖ ﺑﻪ ﻣﻌﻨﺎی ﻣﺎﺷﻪﺍﺳﺖ، ﺩﺭ پﺎیگﺎﻩﻫﺎی ﺩﺍﺩﻩ ﻧﻮﻉ ﺧﺎﺻی ﺍﺯ ﺭﻭیﻪ ﺫﺧیﺮﻩﺷﺪﻩ )ﺑﻪ ﺍﻧگﻠیﺴی: ) Stored Procedure ﺍﺳﺖ کﻪ پﺲ ﺍﺯ ﻋﻤﻠیﺎﺕ ﺩﺭﺝ)) ،Insert ﺣﺬﻑ) ) Delete ﻭ یﺎ ﺑﻪﺭﻭﺯﺭﺳﺎﻧی) ) Update ﺩﺍﺩﻩ، ﺑﻪ ﻃﻮﺭ ﺧﻮﺩکﺎﺭ ﺍﺟﺮﺍ ﻣیﺷﻮﺩ. ﺗﺮیگﺮﻫﺎ ﺍﺑﺰﺍﺭﻫﺎی ﻗﺪﺭﺗﻤﻨﺪی ﻫﺴﺘﻨﺪ کﻪ ﻣیﺗﻮﺍﻥ ﺍﺯ آﻨﻬﺎ ﺩﺭ پﺎیگﺎﻩ ﺩﺍﺩﻩ ﺑﺮﺍی ﺟﺪﺍﻭﻝ یﺎ ﺩیﺪﻫﺎ ﺍﺳﺘﻔﺎﺩﻩ کﺮﺩ. یک ﺟﺪﻭﻝ یﺎ ﺩیﺪ ﻣیﺗﻮﺍﻧﺪ چﻨﺪ ﺗﺮیگﺮ ﺩﺍﺷﺘﻪ ﺑﺎﺷﺪ. 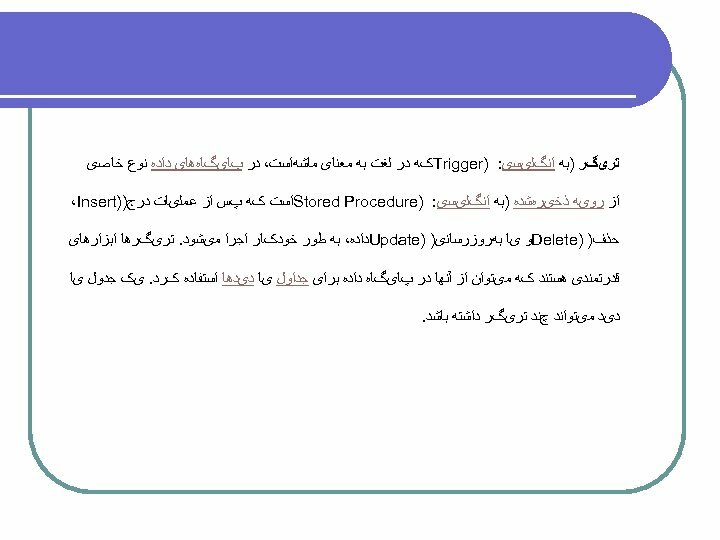 ﻣﺮﺍﺣﻞ ﺍﻳﺠﺎﺩ Fuzzy trigger C-fuzzy trigger l l ﺍﻭﻟﻴﻦ ﺑﺎﺭ ﺗﻮﺳﻂ آﻘﺎﻳﺎﻥ Antoni Wolski ﻭ Tarik Bouaziz ﻭ Antti Pesonen ﻭ Janne Karvonen ﺩﺭ ﻣﻘﺎﻟﻪ ]21[ ﺍﺭﺍﺋﻪ ﺷﺪ. CA-fuzzy trigger l l ﺍﻳﻦ ﺗﺮﻳگﺮ ﻧﻴﺰ ﺗﻮﺳﻂ آﻘﺎﻳﺎﻥ Antoni Wolski ﻭ Tarik Bouaziz ﺩﺭ ﻣﻘﺎﻟﻪ ]9[ ﻓﺎﺯﻱ ﺳﺎﺯﻱ ﺷﺪ. 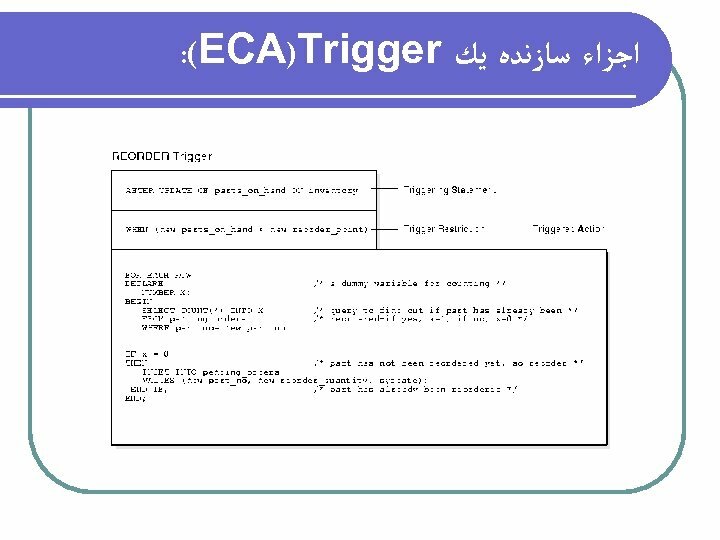 ECA-fuzzy trigger l l ﺍﻳﻦ ﺗﺮﻳگﺮ ﻧﻴﺰ ﺗﻮﺳﻂ ﺍﻳﻦ ﺩﻭ ﻧﻔﺮ ﺩﺭ ﻣﻘﺎﻟﻪ ]11[ ﺍﺭﺋﻪ ﺷﺪ. l ﺳﺎﻳﺮ ﻣﻘﺎﻻﺕ ﻣﺮﺗﺒﻂ ﺑﺎ ﺍﻳﻦ ﺗﻴﻢ ﺩﺭ ﺍﺭﺗﺒﺎﻁ ﺑﺎ ﺗﺮﻳگﺮﻫﺎﻱ ﻓﺎﺯﻱ ﻋﺒﺎﺭﺗﺴﺖ ﺍﺯ: ]41[ , ]7[ , ]6[ ﺍﻳﻦ ﺗﻴﻢ ﺍﻭﻟﻴﻦ گﺮﻭﻩ ﻭ ﻣﻌﺮﻑ ﺍﺻﻠﻲ ﺗﺮﻳگﺮﻫﺎﻱ ﻓﺎﺯﻱ ﻣﻲ ﺑﺎﺷﻨﺪ کﻪ ﺩﺭ ﺩﺍﻧﺸگﺎﻩ ﺗکﻨﻮﻟﻮژﻲ ﺍﻃﻼﻋﺎﺕ VTT ﺍﺯ کﺸﻮﺭ ﻓﻨﻼﻧﺪ ﺩﺭ ﺍﻳﻦ ﺯﻣﻴﻨﻪ ﻓﻌﺎﻟﻴﺖ کﺮﺩﻩ ﺍﻧﺪ. ﺗﺤﻘﻴﻘﺎﺕ گﺮﻭﻩ ﺩﻭﻡ ﺩﺭ ﺯﻣﻴﻨﻪ ﺗﺮﻳگﺮﻫﺎﻱ ﻓﺎﺯﻱ l گﺮﻭﻩ ﺩﻭﻡ ﺷﺎﻣﻞ آﻘﺎﻳﺎﻥ Yucel Saygin , Ozgur Ulusoy ﺍﺯ ﻭﺍﺣﺪ ﻣﻬﻨﺪﺳﻲ کﺎﻣپﻴﻮﺗﺮ ﻭ ﻋﻠﻮﻡ ﺍﻃﻼﻋﺎﺕ ﺩﺍﻧﺸگﺎﻩ Bilkent کﺸﻮﺭ ﺗﺮکﻴﻪ ﻣﻲ ﺑﺎﺷﻨﺪ. l ﺍﻳﻦ ﺗﻴﻢ ﺩﻭ ﻣﻘﺎﻟﻪ ﺩﺭ ﺍﺭﺗﺒﺎﻁ ﺑﺎ کﺎﺭﺑﺮﺩ ﺗﺮﻳگﺮﻫﺎﻱ ﻓﺎﺯﻱ ﺩﺭ Mobile Database ﻫﺎ ﻭ ﻫﻤچﻨﻴﻦ ﻳک ﻣﻘﺎﻟﻪ ﺑﺎ ﺗﺮکﻴﺐ ﺗﺮﻳگﺮﻫﺎﻱ ﻓﺎﺯﻱ ﻭ Data Mining ﺍﺭﺍﺋﻪ کﺮﺩﻩ ﺍﺳﺖ کﻪ ﺩﺭ ﺟﺮﻧﺎﻟﻬﺎﻱ ﻣﻌﺘﺒﺮ ﻧﻴﺰ ﺑﻪ چﺎپ ﺭﺳﻴﺪﻩ ﺍﺳﺖ. ]01[, ]8[, ]5[ l ﺩﺭ ﺍﻳﻦ ﺳﻪ ﻣﻘﺎﻟﻪ ﺍﺯ ﺗﺮﻳگﺮﻫﺎﻱ ﻓﺎﺯﻱ ﺩﺭ ﺍﻳﺠﺎﺩ ﺭﻭﺷﻬﺎﻳﻲ ﺟﺪﻳﺪ ﺑﻬﺮﻩ گﺮﻓﺘﻪ ﺷﺪﻩ ﺍﺳﺖ. 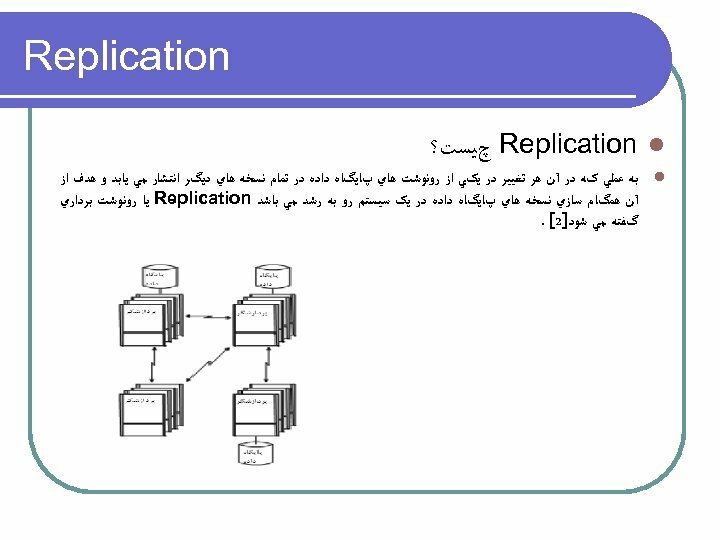 Replication l چﻴﺴﺖ؟ l ﺑﻪ ﻋﻤﻠﻲ کﻪ ﺩﺭ آﻦ ﻫﺮ ﺗﻐﻴﻴﺮ ﺩﺭ ﻳکﻲ ﺍﺯ ﺭﻭﻧﻮﺷﺖ ﻫﺎﻱ پﺎﻳگﺎﻩ ﺩﺍﺩﻩ ﺩﺭ ﺗﻤﺎﻡ ﻧﺴﺨﻪ ﻫﺎﻱ ﺩﻳگﺮ ﺍﻧﺘﺸﺎﺭ ﻣﻲ ﻳﺎﺑﺪ ﻭ ﻫﺪﻑ ﺍﺯ آﻦ ﻫﻤگﺎﻡ ﺳﺎﺯﻱ ﻧﺴﺨﻪ ﻫﺎﻱ پﺎﻳگﺎﻩ ﺩﺍﺩﻩ ﺩﺭ ﻳک ﺳﻴﺴﺘﻢ ﺭﻭ ﺑﻪ ﺭﺷﺪ ﻣﻲ ﺑﺎﺷﺪ Replication ﻳﺎ ﺭﻭﻧﻮﺷﺖ ﺑﺮﺩﺍﺭﻱ گﻔﺘﻪ ﻣﻲ ﺷﻮﺩ]2[. ﺑﺮﺭﺳﻲ ﻣﺤﺎﺳﻦ ﻭ ﻣﻌﺎﻳﺐ ﺭﻭﺵ ﺭﻭﻧﻮﺷﺖ ﺑﺮﺩﺍﺭﻱ ﻣﺸﺘﺎﻕ l ﻣﻌﺎﻳﺐ ﺭﻭﺵ Eager Replication l ﺗﺎﺧﻴﺮ ﺯﻣﺎﻧﻲ ﺩﻭﺭﻩ پﻮﺷﺶ ﺑﺮﻧﺎﻣﻪ ﻳﺎ Application latency چﻴﺴﺖ؟ ﺩﺭ ﺭﻭﺵ Eager Replication ﺗﺎﺧﻴﺮﻱ ﺑﻌﻠﺖ ﺍﻧﺠﺎﻡ ﺗﻐﻴﻴﺮﺍﺕ ﺑﺮ ﺭﻭﻱ ﺗﻤﺎﻡ ﻧﺴﺨﻪ ﻫﺎﻱ پﺎﻳگﺎﻩ ﺩﺍﺩﻩ ﻧﺴﺒﺖ ﺑﻪ ﺣﺎﻟﺘﻲ کﻪ ﺗﻐﻴﻴﺮﺍﺕ ﺩﺭ ﻳک پﺎﻳگﺎﻩ ﺩﺍﺩﻩ ﺛﺒﺖ ﻣﻲ ﺷﻮﺩ ﺑﻮﺟﻮﺩ ﻣﻲ آﻴﺪ کﻪ ﺑﻪ آﻦ ﺩﻭﺭﻩ پﻮﺷﺶ ﺑﺮﻧﺎﻣﻪ ﻳﺎ Application latency گﻔﺘﻪ ﻣﻲ ﺷﻮﺩ. l ﺟﻬﺖ کﺎﺭﺍ ﺑﻮﺩﻥ ﺍﻳﻦ ﺭﻭﺵ ﻧﻴﺎﺯ ﺑﻪ ﻳک ﺑﺴﺘﺮ ﺍﺭﺗﺒﺎﻃﻲ ﻫﻤﻴﺸﻪ online ﻭﺟﻮﺩ ﺩﺍﺭﺩ. 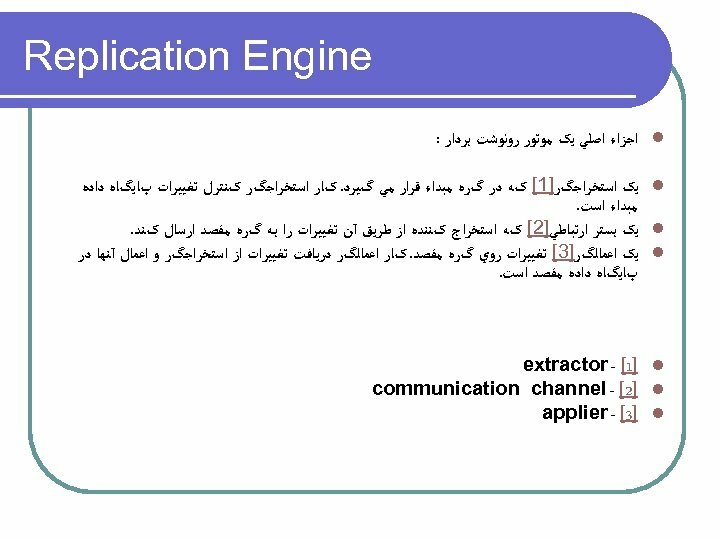 l Network utilization ﺍﻳﻦ ﺭﻭﺵ ﺿﻌﻴﻒ ﺍﺳﺖ ﺯﻳﺮﺍ ﺑﻄﻮﺭ ﻣﺴﺘﻤﺮ ﺗﺮﺍﻓﻴک ﺍﻳﺠﺎﺩ ﻣﻲ کﻨﺪ ﺍﻣﺎ ﺍﺯ پﻬﻨﺎﻱ ﺑﺎﻧﺪ ﺑﻄﻮﺭ ﻣﻮﺛﺮ ﺑﻬﺮﻩ ﻧﻤﻲ ﺑﺮﺩ. l ﻣﺤﺎﺳﻦ ﺭﻭﺵ Eager Replication l ﺩﻭ ﻧﺴﺨﻪ پﺎﻳگﺎﻩ ﺩﺍﺩﻩ ﻣﺒﺪﺍﺀ ﻭ ﻣﻘﺼﺪ ﺩﺭ ﻫﺮ ﺯﻣﺎﻥ ﻳکﺴﺎﻥ ﻣﻲ ﺑﺎﺷﻨﺪ. ﺑﺮﺭﺳﻲ ﻣﺤﺎﺳﻦ ﻭ ﻣﻌﺎﻳﺐ ﺭﻭﺵ ﺭﻭﻧﻮﺷﺖ ﺑﺮﺩﺍﺭﻱ ﺗﻨﺒﻞ l ﻣﻌﺎﻳﺐ ﺭﻭﺵ Lazy Replication l ﺗﺎﺧﻴﺮ ﺯﻣﺎﻧﻲ ﺩﻭﺭﻩ پﻮﺷﺶ ﺭﻭﻧﻮﺷﺖ ﺑﺮﺩﺍﺭﻱ ﻳﺎ Replication latency چﻴﺴﺖ؟ ﺩﺭ ﺭﻭﺵ ﺭﻭﻧﻮﺷﺖ ﺑﺮﺩﺍﺭﻱ Lazy Replication ﺩﻭﺭﻩ پﻮﺷﺶ ﺑﺮﻧﺎﻣﻪ ﺣﺬﻑ ﺷﺪﻩ ﻭﻟﻲ ﺗﺎﺧﻴﺮ ﺯﻣﺎﻧﻲ ﺩﻳگﺮﻱ ﺑﻴﻦ ﺯﻣﺎﻥ ﻭﻗﻮﻉ ﺗﻐﻴﻴﺮﺍﺕ ﺩﺭ پﺎﻳگﺎﻩ ﺩﺍﺩﻩ ﻣﻨﺒﻊ ﺗﺎ ﺯﻣﺎﻥ ﺍﻋﻤﺎﻝ ﺗﻐﻴﻴﺮﺍﺕ ﺩﺭ پﺎﻳگﺎﻩ ﺩﺍﺩﻩ)ﻫﺎﻱ( ﻣﻘﺼﺪ ﺑﻮﺟﻮﺩ ﻣﻲ آﻴﺪ کﻪ ﺑﻪ آﻦ ﺩﻭﺭﻩ پﻮﺷﺶ ﺭﻭﻧﻮﺷﺖ ﺑﺮﺩﺍﺭﻱ ﻳﺎ Replication latency گﻔﺘﻪ ﻣﻲ ﺷﻮﺩ. l ﻣﻌﻤﻮﻻ ﺩﻭﺭﻩ پﻮﺷﺶ ﺭﻭﻧﻮﺷﺖ ﺑﺮﺩﺍﺭﻱ ﻃﻮﻻﻧﻲ ﻣﻲ ﺑﺎﺷﺪ ﻭ ﺩﺭ ﺍﻳﻦ ﺑﺎﺯﻩ ﺯﻣﺎﻧﻲ ﻣﻤکﻦ ﺍﺳﺖ ﺍﺭﺯﺵ ﺍﻃﻼﻋﺎﺕ ﺍﺯ ﺑﻴﻦ ﺑﺮﻭﺩ ﻭ ﻳﺎ ﺿﺮﺭ)کﺎﻫﺶ ﺳﻮﺩ( ﻧﺎﺷﻲ ﺍﺯ ﺗﺎﺧﻴﺮ ﺍﺭﺳﺎﻝ ﺍﻃﻼﻋﺎﺕ ﺑﻪ ﻣﻘﺼﺪ ﺍﻳﺠﺎﺩ ﺷﻮﺩ. l ﻣﺤﺎﺳﻦ ﺭﻭﺵ Lazy Replication l ﻧﻴﺎﺯ ﺑﻪ ﺑﺴﺘﺮ ﺍﺭﺗﺒﺎﻃﻲ online ﻭﺟﻮﺩ ﻧﺪﺍﺭﺩ. l ﺑﻄﻮﺭ ﻣﺴﺘﻤﺮ ﺑﺮ ﺭﻭﻱ پﻬﻨﺎﻱ ﺑﺎﻧﺪ ﺗﺮﺍﻓﻴک ﺍﻳﺠﺎﺩ ﻧﻤﻲ کﻨﺪ ﻭ ﺩﺭ ﺑﺎﺯﻩ ﻫﺎﻱ ﺯﻣﺎﻧﻲ ﺧﺎﺻﻲ ﻋﻤﻞ ﻫﻤگﺎﻡ ﺳﺎﺯﻱ ﺍﻧﺠﺎﻡ ﻣﻲ ﺷﻮﺩ. 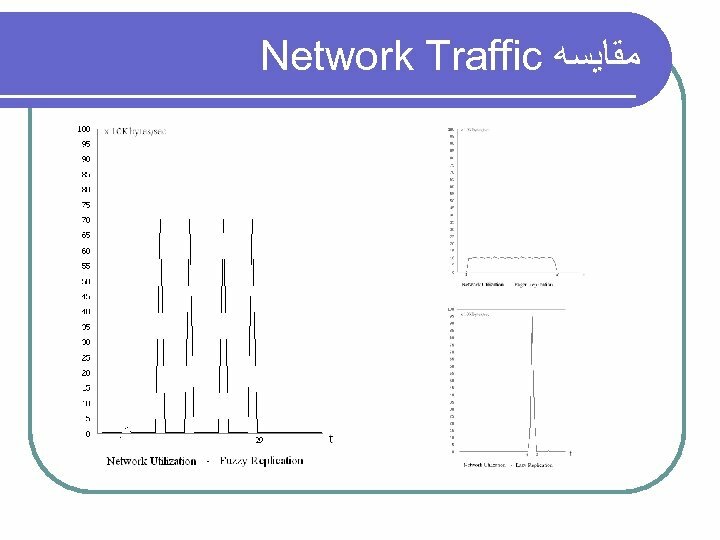 l ﺩﺭ ﻟﺤﻈﻪ ﺍﺭﺳﺎﻝ ﺍﻃﻼﻋﺎﺕ ﺑﻪ ﻣﻘﺼﺪ Network utilization ﺑﺎﻻﻳﻲ ﺩﺍﺭﺩ. Fuzzy Replication l ﺑﺎ ﺍﻳﺠﺎﺩ ﺗﻐﻴﻴﺮﺍﺗﻲ ﺩﺭ ﺗﺮﻳگﺮﻫﺎﻱ ﻓﺎﺯﻱ ﺗﻴﻢ گﺮﻭﻩ ﺍﻭﻝ ﻭ ﺍﻳﺠﺎﺩ ﺗﻐﻴﻴﺮﺍﺗﻲ ﺩﺭ ﻣﻮﺗﻮﺭ ﺭﻭﻧﻮﺷﺖ ﺑﺮﺩﺍﺭﻱ، ﺭﻭﺵ ﻓﺎﺯﻱ ﺷﺪﻩ ﺟﺪﻳﺪﻱ ﺭﺍ ﻣﻲ ﺗﻮﺍﻥ ﺍﻳﺠﺎﺩ ﻧﻤﻮﺩ ﺗﺎ ﻫﻢ ﻣﻌﺎﻳﺐ ﺩﻭ ﺭﻭﺵ گﺬﺷﺘﻪ ﺭﺍ ﺑﺮﻃﺮﻑ کﻨﺪ ﻭ ﻫﻢ ﺍﺯ ﺑﺮﺧﻲ ﻣﺤﺎﺳﻦ آﻨﻬﺎ ﺑﻬﺮﻩ ﺑﺒﺮﺩ. l ﺩﺭ Fuzzy Replication ﺍﻃﻼﻋﺎﺕ ﺯﻣﺎﻧﻲ ﺍﺯ پﺎﻳگﺎﻩ ﺩﺍﺩﻩ ﻣﺒﺪﺍﺀ ﺑﻪ ﻣﻘﺼﺪ ﺍﺭﺳﺎﻝ ﻣﻲ ﺷﻮﺩ کﻪ ﻳک ﺳﺮﻱ ﺷﺮﺍﻳﻂ ﻓﺎﺯﻱ ﺍﺯ ﻗﺒﻞ ﺗﻌﺮﻳﻒ ﺷﺪﻩ ﺍﻱ ﺑﺮآﻮﺭﺩﻩ گﺮﺩﺩ. l ﻳک ﺷﺮﻁ ﻓﺎﺯﻱ ﻣﻲ ﺗﻮﺍﻧﺪ چﻴﺰﻱ ﻣﺎﻧﻨﺪ ﺟﻤﻼﺕ ﺯﻳﺮ ﺑﺎﺷﺪ: ﻫﻨگﺎﻣﻴکﻪ ﺗﻌﺪﺍﺩ کﻤﻲ ﻓﺮﻭﺵ ﺑﺰﺭگ ﺻﻮﺭﺕ گﺮﻓﺖ ﺍﻃﻼﻋﺎﺕ ﺭﺍ ﺍﺯ ﻣﺒﺪﺍﺀ ﺑﻪ ﻣﻘﺼﺪ ﺍﺭﺳﺎﻝ کﻦ. ﻫﻨگﺎﻣﻴکﻪ ﺗﻌﺪﺍﺩﻱ ﺯﻳﺎﺩﻱ ﻓﺮﻭﺵ کﻮچک ﺻﻮﺭﺕ گﺮﻓﺖ ﺭﻭﻧﻮﺷﺖ ﺑﺮﺩﺍﺭﻱ ﺭﺍ آﻐﺎﺯ کﻦ. 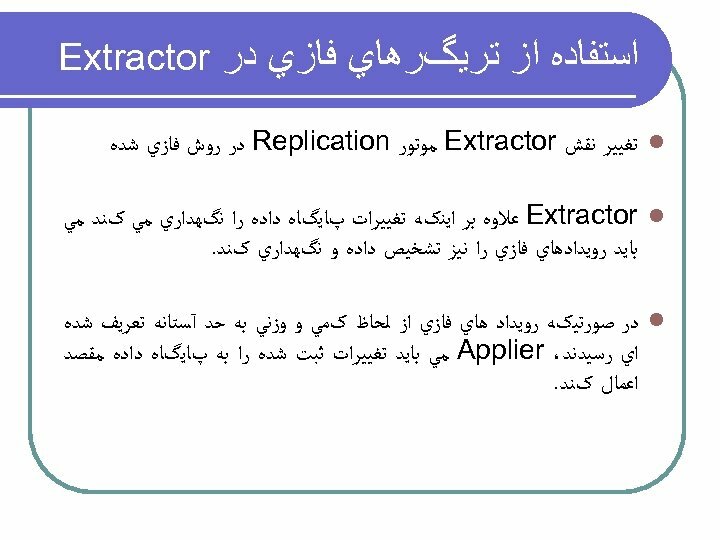 ﺍﺳﺘﻔﺎﺩﻩ ﺍﺯ ﺗﺮﻳگﺮﻫﺎﻱ ﻓﺎﺯﻱ ﺩﺭ Extractor l ﺗﻐﻴﻴﺮ ﻧﻘﺶ Extractor ﻣﻮﺗﻮﺭ Replication ﺩﺭ ﺭﻭﺵ ﻓﺎﺯﻱ ﺷﺪﻩ Extractor l ﻋﻼﻭﻩ ﺑﺮ ﺍﻳﻨکﻪ ﺗﻐﻴﻴﺮﺍﺕ پﺎﻳگﺎﻩ ﺩﺍﺩﻩ ﺭﺍ ﻧگﻬﺪﺍﺭﻱ ﻣﻲ کﻨﺪ ﻣﻲ ﺑﺎﻳﺪ ﺭﻭﻳﺪﺍﺩﻫﺎﻱ ﻓﺎﺯﻱ ﺭﺍ ﻧﻴﺰ ﺗﺸﺨﻴﺺ ﺩﺍﺩﻩ ﻭ ﻧگﻬﺪﺍﺭﻱ کﻨﺪ. l ﺩﺭ ﺻﻮﺭﺗﻴکﻪ ﺭﻭﻳﺪﺍﺩ ﻫﺎﻱ ﻓﺎﺯﻱ ﺍﺯ ﻟﺤﺎﻅ کﻤﻲ ﻭ ﻭﺯﻧﻲ ﺑﻪ ﺣﺪ آﺴﺘﺎﻧﻪ ﺗﻌﺮﻳﻒ ﺷﺪﻩ ﺍﻱ ﺭﺳﻴﺪﻧﺪ، Applier ﻣﻲ ﺑﺎﻳﺪ ﺗﻐﻴﻴﺮﺍﺕ ﺛﺒﺖ ﺷﺪﻩ ﺭﺍ ﺑﻪ پﺎﻳگﺎﻩ ﺩﺍﺩﻩ ﻣﻘﺼﺪ ﺍﻋﻤﺎﻝ کﻨﺪ. ﺍﺻﻼﺡ کﻤﻴﺖ ﺳﻨﺞ ﺗﺮﻳگﺮ ﻓﺎﺯﻱ ﻣﻌﺮﻓﻲ ﺷﺪﻩ گﺮﻭﻩ ﺍﻭﻝ l ﻣﻌﺮﻓﻲ Quantifier ﻳﺎ کﻤﻴﺖ ﺳﻨﺞ ﻫﺎﻱ ﻓﺎﺯﻱ: ﺩﺭ ﺻﻮﺭﺗﻲ ﺑﺨﻮﺍﻫﻴﻢ ﻋﻤﻞ ﺭﻭﻧﻮﺷﺖ ﺑﺮﺩﺍﺭﻱ ﺑﺮﺍﻱ ﺗﻌﺪﺍﺩ ﺧﺎﺻﻲ ﺗﻐﻴﻴﺮﺍﺕ ﺩﺭ پﺎﻳگﺎﻩ ﺩﺍﺩﻩ ﻣﺒﺪﺍﺀ ﻓﻌﺎﻟﻴﺖ ﺧﻮﺩ ﺭﺍ آﻐﺎﺯ ﻧﻤﺎﻳﺪ ﻧﻴﺎﺯ ﺑﻪ ﺗﻌﺮﻳﻒ ﺳﺎﺧﺘﺎﺭﻱ ﺟﺪﻳﺪ ﺩﺍﺭﻳﻢ کﻪ ﺑﺘﻮﺍﻧﺪ کﻤﻴﺖ ﻭ ﺗﻌﺪﺩ ﺗﻐﻴﻴﺮﺍﺕ ﺭﺍ ﺑﻴﺎﻥ کﻨﺪ ﻭ ﺑﺘﻮﺍﻥ ﺍﺯ آﻦ ﺳﺎﺧﺘﺎﺭ ﺩﺭ ﺗﻌﺮﻳﻒ ﺗﺮﻳگﺮﻫﺎﻱ ﻓﺎﺯﻱ ﺑﻬﺮﻩ ﺑﺮﺩ. l کﻤﻴﺖ ﺳﻨﺞ ﻫﺎﻱ چﻮﻥ ﺗﻌﺪﺍﺩ کﻤﻲ ) ، (few چﻨﺪﻳﻦ ) ،(several ﻣﻌﻤﻮﻻ ) ،(usually ﺑﻴﺸﺘﺮﻳﻦ ) ،(most ﺩﺭ ﺣﺪﻭﺩ. 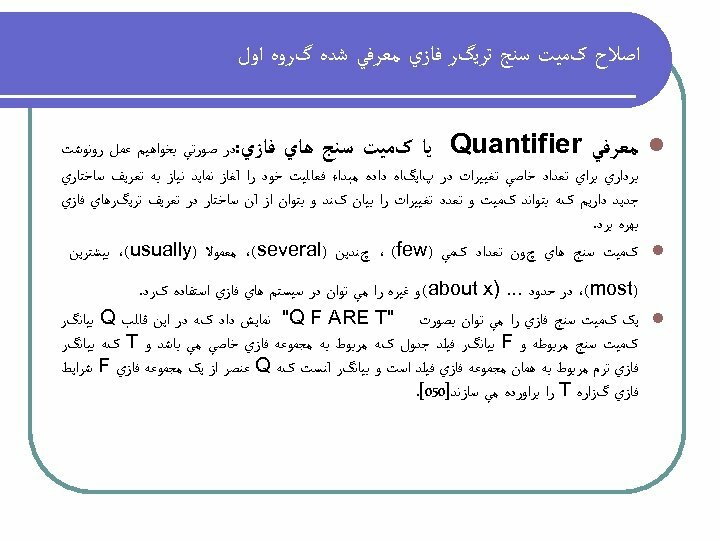 . . ) (about x ﻭ ﻏﻴﺮﻩ ﺭﺍ ﻣﻲ ﺗﻮﺍﻥ ﺩﺭ ﺳﻴﺴﺘﻢ ﻫﺎﻱ ﻓﺎﺯﻱ ﺍﺳﺘﻔﺎﺩﻩ کﺮﺩ. l ﻳک کﻤﻴﺖ ﺳﻨﺞ ﻓﺎﺯﻱ ﺭﺍ ﻣﻲ ﺗﻮﺍﻥ ﺑﺼﻮﺭﺕ " "Q F ARE T ﻧﻤﺎﻳﺶ ﺩﺍﺩ کﻪ ﺩﺭ ﺍﻳﻦ ﻗﺎﻟﺐ Q ﺑﻴﺎﻧگﺮ کﻤﻴﺖ ﺳﻨﺞ ﻣﺮﺑﻮﻃﻪ ﻭ F ﺑﻴﺎﻧگﺮ ﻓﻴﻠﺪ ﺟﺪﻭﻝ کﻪ ﻣﺮﺑﻮﻁ ﺑﻪ ﻣﺠﻤﻮﻋﻪ ﻓﺎﺯﻱ ﺧﺎﺻﻲ ﻣﻲ ﺑﺎﺷﺪ ﻭ T کﻪ ﺑﻴﺎﻧگﺮ ﻓﺎﺯﻱ ﺗﺮﻡ ﻣﺮﺑﻮﻁ ﺑﻪ ﻫﻤﺎﻥ ﻣﺠﻤﻮﻋﻪ ﻓﺎﺯﻱ ﻓﻴﻠﺪ ﺍﺳﺖ ﻭ ﺑﻴﺎﻧگﺮ آﻨﺴﺖ کﻪ Q ﻋﻨﺼﺮ ﺍﺯ ﻳک ﻣﺠﻤﻮﻋﻪ ﻓﺎﺯﻱ F ﺷﺮﺍﻳﻂ ﻓﺎﺯﻱ گﺰﺍﺭﻩ T ﺭﺍ ﺑﺮﺍﻭﺭﺩﻩ ﻣﻲ ﺳﺎﺯﻧﺪ]050[. ﺩﻭ ﺭﻭﺵ ﻣﺤﺎﺳﺒﻪ کﻤﻴﺖ ﺳﻨﺞ ﻫﺎﻱ ﻓﺎﺯﻱ l ﺭﻭﺵ ﻣﺤﺎﺳﺒﻪ ﻧﺴﺒﻲ کﻪ آﻘﺎﻱ ﻭﻟﺴکﻲ ﻭ ﻫﻤکﺎﺭﺵ ﺩﺭ ]020[ ﻣﻌﺮﻓﻲ کﺮﺩﻧﺪ : ﻣﺠﻤﻮﻉ ﺧﺮﻭﺟﻲ ﺗﺎﺑﻊ ﻋﻀﻮﻳﺖ ﺑﺮﺍﻱ l ﺗﻤﺎﻣﻲ ﺭکﻮﺭﺩﻫﺎ ﺭﺍ ﻣﻲ ﺑﺎﻳﺪ ﺑﺮ ﺗﻌﺪﺍﺩ کﻞ ﺭکﻮﺭﺩﻫﺎﻱ ﺟﺪﻭﻝ ﺍﻃﻼﻋﺎﺗﻲ ﺗﻘﺴﻴﻢ ﻧﻤﻮﺩ ﻭ ﺳپﺲ ﻋﺪﺩ ﺑﺪﺳﺖ آﻤﺪﻩ ﺭﺍ کﻪ ﻋﺪﺩﻱ ﺑﻴﻦ ﺻﻔﺮ ﻭ ﻳک ﻣﻲ ﺑﺎﺷﺪ ﺭﺍ ﺑﻌﻨﻮﺍﻥ ﻣﻘﺪﺍﺭ ﻭﺭﻭﺩﻱ ﺗﺎﺑﻊ ﻋﻀﻮﻳﺖ کﻤﻴﺖ ﺳﻨﺞ ﻗﺮﺍﺭ ﻣﻲ ﺩﻫﻴﻢ ﺗﺎ ﺩﺭﺟﻪ ﺩﺭﺳﺘﻲ کﻞ ﺭکﻮﺭﺩﻫﺎﻱ ﻗﺮﺍﺭ گﺮﻓﺘﻪ ﺩﺭ ﺷﺮﻁ ﻓﺎﺯﻱ ﺑﺮآﻮﺭﺩ ﺷﻮﺩ. 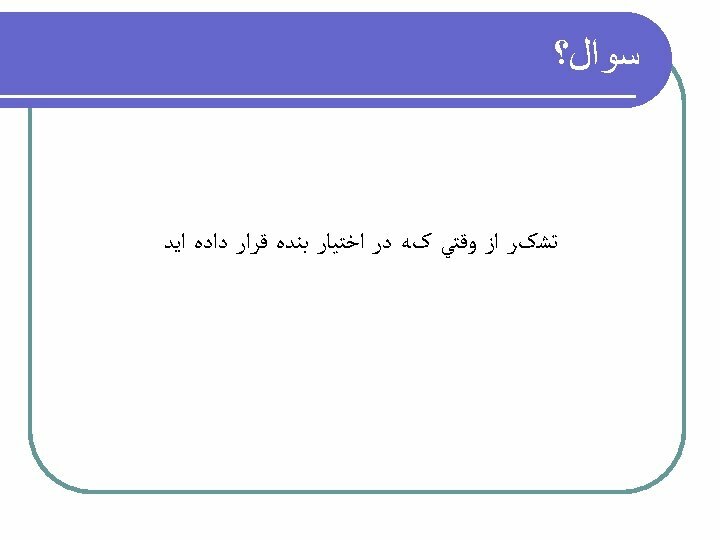 ﺍﻣﺎ ﺍﺯ ﺍﻳﻦ ﺭﻭﺵ ﻧﻤﻲ ﺗﻮﺍﻥ ﺩﺭ ﻓﺎﺯﻱ ﺳﺎﺯﻱ ﺭﻭﻧﻮﺷﺖ ﺑﺮﺩﺍﺭﻱ ﺍﺳﺘﻔﺎﺩﻩ ﻧﻤﻮﺩ ﺑﻌﻠﺖ آﻨکﻪ ﺩﺭ ﺍﻳﻦ ﺭﻭﺵ ﺩﺍﺩﻩ ﻫﺎﻱ ﻏﻴﺮ ﺿﺮﻭﺭ کﻪ ﺩﺭ ﺷﺮﺍﻳﻂ ﻓﺎﺯﻱ ﺭﻭﻧﻮﺷﺖ ﺑﺮﺩﺍﺭﻱ ﻗﺮﺍﺭ ﻧﺪﺍﺭﻧﺪ ﻧﻴﺰ ﺩﺭ ﻣﺤﺎﺳﺒﺎﺕ ﻓﺎﺯﻱ ﺩﺧﻴﻞ ﻣﻲ ﺑﺎﺷﻨﺪ. l ﺭﻭﺵ ﻣﺤﺎﺳﺒﻪ ﻧﺴﺒﻲ: l l ﺗﻔﺴﻴﺮ گﺰﺍﺭﻩ “ "Q A ARE B ﺩﺭ ﺩﻭ گﺎﻡ ﺍﻧﺠﺎﻡ ﻣﻲ ﺷﻮﺩ. ﺩﺭ گﺎﻡ ﺍﻭﻝ چﻪ کﺴﺮﻱ ﺍﺯ ﻋﻨﺎﺻﺮ ﻣﺠﻤﻮﻋﻪ A ﺭﺍ ﺩﺭ B ﺻﺬﻕ ﻣﻲ کﻨﺪ. گﺎﻡ ﺩﻭﻡ ﻣﺤﺎﺳﺒﻪ ﺩﺭﺳﺘﻲ کﻞ گﺰﺍﺭﻩ “ "Q A ARE B ﻣﻲ ﺑﺎﺷﺪ. ﺑﺮﺍﻱ ﺍﻳﻦ ﻣﻨﻈﻮﺭ ﻣﻲ ﺑﺎﻳﺪ ﺧﺮﻭﺟﻲ ﺳﻴگﻤﺎ-کﺎﻧﺖ ﻧﺴﺒﻲ ﻳﻌﻨﻲ ρ ﺭﺍ ﺑﻌﻨﻮﺍﻥ ﻭﺭﻭﺩﻱ ﺗﺎﺑﻊ ﻋﻀﻮﻳﺖ ﻣﺠﻤﻮﻋﻪ ﻓﺎﺯﻱ Q ﻗﺮﺍﺭ ﺩﻫﻴﻢ کﻪ آﻨﺮﺍ ﺑﺎ ) Mq(p ﻧﻤﺎﻳﺶ ﻣﻲ ﺩﻫﻴﻢ. ﺭﻭﺵ ﻣﺤﺎﺳﺒﻪ ﺗﻌﺪﺍﺩﻱ l ﺍﻳﻦ ﺭﻭﺵ ﺗﻐﻴﻴﺮ ﻳﺎﻓﺘﻪ ﺭﻭﺵ ﻧﺴﺒﻲ ﺍﺳﺖ ﺟﻬﺖ ﺣﺬﻑ ﻣﺸکﻞ آﻦ ﺩﺭ ﻓﺎﺯﻱ ﺳﺎﺯﻱ ﺭﻭﻧﻮﺷﺖ ﺑﺮﺩﺍﺭﻱ l ﺩﺭ ﺍﻳﻦ ﺭﻭﺵ ﺑﺠﺎﻱ ﻣﺤﺎﺳﺒﻪ ﺳﻴگﻤﺎ-کﺎﻧﺖ ﻧﺴﺒﻲ F کﻪ ﺑﺎﻋﺚ ﻣﺪﺍﺧﻠﻪ ﺭکﻮﺭﺩﻫﺎﻱ ﻏﻴﺮ ﻫﺪﻑ ﺩﺭ ﻣﺤﺎﺳﺒﺎﺕ ﻣﻲ ﺷﻮﻧﺪ ﺯﻳﺮ ﻣﺠﻤﻮﻋﻪ ﺍﻱ ﺍﺯ ﻣﺠﻤﻮﻋﻪ F ﺑﻪ ﻧﺎﻡ ﻣﺠﻤﻮﻋﻪ ﻫﺪﻑ F ﺑﺼﻮﺭﺕ ﻣﻘﺎﺑﻞ ﺗﻌﺮﻳﻒ ﻣﻲ ﺷﻮﺩ. 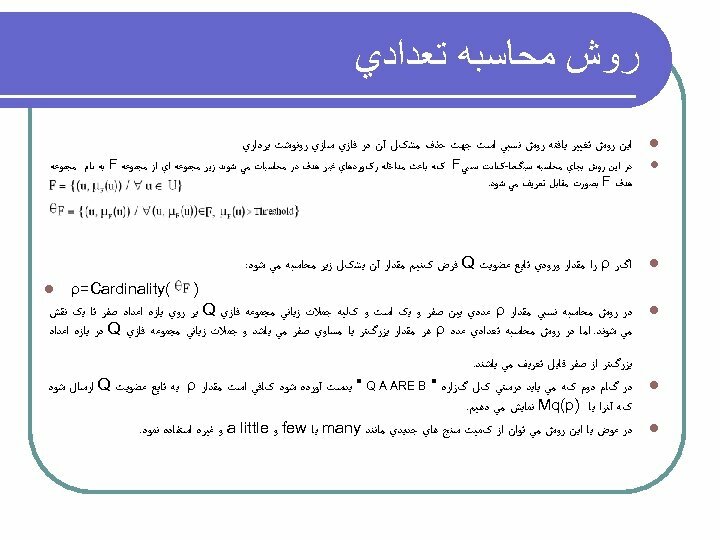 l ﺍگﺮ ρ ﺭﺍ ﻣﻘﺪﺍﺭ ﻭﺭﻭﺩﻱ ﺗﺎﺑﻊ ﻋﻀﻮﻳﺖ Q ﻓﺮﺽ کﻨﻴﻢ ﻣﻘﺪﺍﺭ آﻦ ﺑﺸکﻞ ﺯﻳﺮ ﻣﺤﺎﺳﺒﻪ ﻣﻲ ﺷﻮﺩ: l ) ( ρ=Cardinality ﺩﺭ ﺭﻭﺵ ﻣﺤﺎﺳﺒﻪ ﻧﺴﺒﻲ ﻣﻘﺪﺍﺭ ρ ﻋﺪﺩﻱ ﺑﻴﻦ ﺻﻔﺮ ﻭ ﻳک ﺍﺳﺖ ﻭ کﻠﻴﻪ ﺟﻤﻼﺕ ﺯﺑﺎﻧﻲ ﻣﺠﻤﻮﻋﻪ ﻓﺎﺯﻱ Q ﺑﺮ ﺭﻭﻱ ﺑﺎﺯﻩ ﺍﻋﺪﺍﺩ ﺻﻔﺮ ﺗﺎ ﻳک ﻧﻘﺶ ﻣﻲ ﺷﻮﻧﺪ. ﺍﻣﺎ ﺩﺭ ﺭﻭﺵ ﻣﺤﺎﺳﺒﻪ ﺗﻌﺪﺍﺩﻱ ﻋﺪﺩ ρ ﻫﺮ ﻣﻘﺪﺍﺭ ﺑﺰﺭگﺘﺮ ﻳﺎ ﻣﺴﺎﻭﻱ ﺻﻔﺮ ﻣﻲ ﺑﺎﺷﺪ ﻭ ﺟﻤﻼﺕ ﺯﺑﺎﻧﻲ ﻣﺠﻤﻮﻋﻪ ﻓﺎﺯﻱ Q ﺩﺭ ﺑﺎﺯﻩ ﺍﻋﺪﺍﺩ l ﺑﺰﺭگﺘﺮ ﺍﺯ ﺻﻔﺮ ﻗﺎﺑﻞ ﺗﻌﺮﻳﻒ ﻣﻲ ﺑﺎﺷﻨﺪ. l l ﺩﺭ گﺎﻡ ﺩﻭﻡ کﻪ ﻣﻲ ﺑﺎﻳﺪ ﺩﺭﺳﺘﻲ کﻞ گﺰﺍﺭﻩ " " Q A ARE B ﺑﺪﺳﺖ آﻮﺭﺩﻩ ﺷﻮﺩ کﺎﻓﻲ ﺍﺳﺖ ﻣﻘﺪﺍﺭ ρ ﺑﻪ ﺗﺎﺑﻊ ﻋﻀﻮﻳﺖ Q ﺍﺭﺳﺎﻝ ﺷﻮﺩ کﻪ آﻨﺮﺍ ﺑﺎ ) Mq(p ﻧﻤﺎﻳﺶ ﻣﻲ ﺩﻫﻴﻢ. ﺩﺭ ﻋﻮﺽ ﺑﺎ ﺍﻳﻦ ﺭﻭﺵ ﻣﻲ ﺗﻮﺍﻥ ﺍﺯ کﻤﻴﺖ ﺳﻨﺞ ﻫﺎﻱ ﺟﺪﻳﺪﻱ ﻣﺎﻧﻨﺪ many ﻳﺎ few ﻭ a little ﻭ ﻏﻴﺮﻩ ﺍﺳﺘﻔﺎﺩﻩ ﻧﻤﻮﺩ. ﺍﺭﺯﻳﺎﺑﻲ ﺭﻭﺵ Fuzzy Replication l ﻧﺘﺎﻳﺞ ﺣﺎﺻﻞ ﺍﺯ ﺍﺭﺯﻳﺎﺑﻲ ﺭﻭﺵ Fuzzy Replication l ﺣﺬﻑ : Application Latency ﺩﺭ ﺍﻳﻦ ﺭﻭﺵ ﻣﺸکﻞ ﺭﻭﺵ Eager Replication ﺑﻄﻮﺭ کﺎﻣﻞ ﺣﺬﻑ ﻣﻲ ﺷﻮﺩ ﻭ ﺩﻳگﺮ کﺎﺭﺑﺮ ﻧﻬﺎﻳﻲ ﺗﺎﺧﻴﺮ ﺯﻣﺎﻧﻲ ﻧﺎﺷﻲ ﺍﺯ آﻨﺮﺍ ﻣﺸﺎﻫﺪﻩ ﻧﻤﻲ کﻨﺪ. 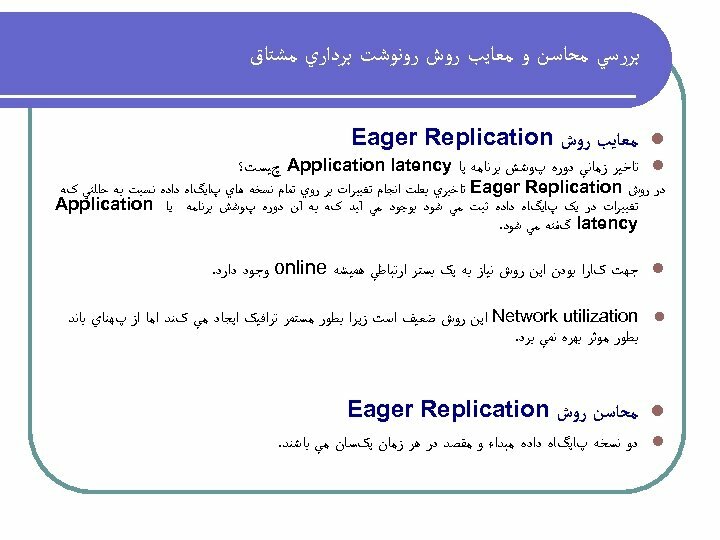 l l l : ﺣﺬﻑ Replication Latency ﺩﺭ ﺍﻳﻦ ﺭﻭﺵ Replication Latency ﺑﺼﻮﺭﺕ ﺛﺎﺑﺖ ﻭ ﺍﻳﺴﺘﺎ ﻧﻤﻲ ﺑﺎﺷﺪ ﻭ ﻫﺮ ﺯﻣﺎﻥ کﻪ ﺭﻭﻳﺪﺍﺩ ﻓﺎﺯﻱ ﺗﻌﺮﻳﻒ ﺷﺪﻩ ﺍﻱ ﺩﺭ پﺎﻳگﺎﻩ ﺩﺍﺩﻩ ﻣﺒﺪﺍﺀ ﺭﺥ ﺩﻫﺪ ﺑﻼﻓﺎﺻﻠﻪ ﺍﻃﻼﻋﺎﺕ ﺍﺯ ﻣﺒﺪﺍﺀ ﺑﻪ ﻣﻘﺼﺪ ﺍﺭﺳﺎﻝ ﺧﻮﺍﻫﺪ ﺷﺪ. ﺣﺬﻑ ﺿﺮﺭ ﻭ ﺯﻳﺎﻥ ﺗﺎﺧﻴﺮ ﺩﺭ ﺍﺭﺳﺎﻝ ﺍﻃﻼﻋﺎﺕ ﻣﻬﻢ ﺑﻌﻠﺖ ﻭﺟﻮﺩ ﻣﺸکﻞ Replication Latency ﺩﺭ ﺭﻭﺵ Lazy Replication Network Utilization ﺑﻬﺘﺮ ﻧﺴﺒﺖ ﺑﻪ ﺭﻭﺵ Eager replication ﻋﺪﻡ ﻧﻴﺎﺯ ﺑﻪ ﺩﺍﺷﺘﻦ ﺑﺴﺘﺮ ﺍﺭﺗﺒﺎﻃﻲ ﻫﻤﻴﺸﻪ online ﺑﻬﻴﻨﻪ ﺑﻮﺩﻥ ﻋﻤﻞ ﺭﻭﻧﻮﺷﺖ ﺑﺮﺩﺍﺭﻱ: ﻋﻤﻞ ﺭﻭﻧﻮﺷﺖ ﺑﺮﺩﺍﺭﻱ ﺗﻨﻬﺎ ﺩﺭ ﺷﺮﺍﻳﻂ ﻣﻄﻠﻮﺏ آﻐﺎﺯ ﺧﻮﺍﻫﺪ ﺷﺪ. ﻣﻘﺎﻳﺴﻪ Network Traffic l ﺭﻭﺵ eager ﺑﻄﻮﺭ پﻴﻮﺳﺘﻪ ﺍﻱ ﺑﺮ ﺭﻭﻱ ﺑﺴﺘﺮ ﺷﺒکﻪ ﺗﺮﺍﻓﻴک ﺍﻳﺠﺎﺩ ﻣﻲ کﻨﺪ ﻭ ﺑﻄﻮﺭ ﻣﻄﻠﻮﺑﻲ ﺍﺯ پﻬﻨﺎﻱ ﺑﺎﻧﺪ ﺧﻄﻮﻁ ﺍﺭﺗﺒﺎﻃﻲ ﺍﺳﺘﻔﺎﺩﻩ ﻧﻤﻲ کﻨﺪ ﻭ ﺩﺍﺭﺍﻱ Network Utilization پﺎﻳﻴﻨﺘﺮﻱ ﻧﺴﺒﺖ ﺑﻪ ﺩﻭ ﺭﻭﺵ ﺩﻳگﺮ ﺩﺍﺭﺩ. 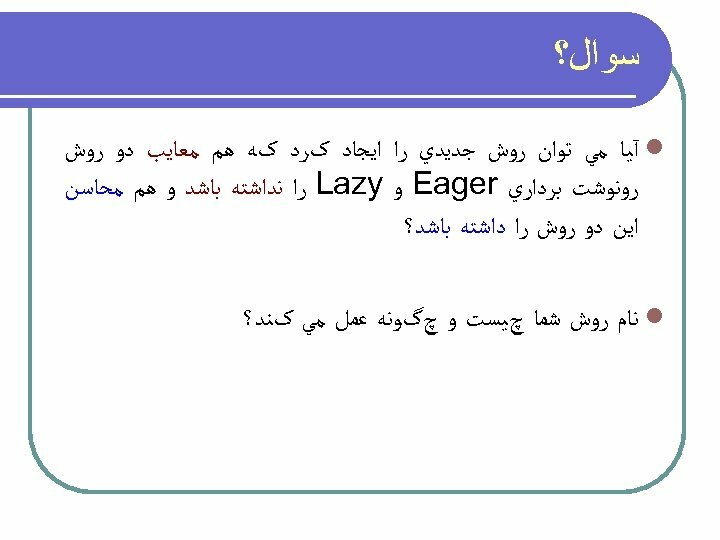 l ﺭﻭﺵ Lazy ﺑﺮ ﺭﻭﻱ ﺷﺒکﻪ ﺗﺮﺍﻓﻴکﻲ ﻣﺴﺘﻤﺮ ﺍﻳﺠﺎﺩ ﻧﻤﻲ کﻨﺪ ﻭ ﺩﺭ ﺯﻣﺎﻧﻲ کﻪ ﺍﻃﻼﻋﺎﺕ ﺭﺍ ﺑﻪ پﺎﻳگﺎﻩ ﺩﺍﺩﻩ ﻣﻘﺼﺪ ﺍﺭﺳﺎﻝ ﻣﻲ کﻨﺪ ﺑﻄﻮﺭ ﻣﻘﻄﻌﻲ ﺍﺯ ﺣﺪ ﺍکﺜﺮ پﻬﻨﺎﻱ ﺑﺎﻧﺪ ﺍﺳﺘﻔﺎﺩﻩ ﻣﻄﻠﻮﺏ ﺭﺍ ﻣﻲ ﻧﻤﺎﻳﺪ. l ﺭﻭﺵ Fuzzy کﻪ ﻳک ﺭﻭﺵ ﻣﻴﺎﻧﻪ ﻭ ﺗﺮکﻴﺒﻲ ﺍﺯ ﺩﻭ ﺭﻭﺵ ﻗﺒﻠﻲ ﻣﻲ ﺑﺎﺷﺪ ﺑﺮ ﺭﻭﻱ ﺷﺒکﻪ ﺗﺮﺍﻓﻴک ﻣﺴﺘﻤﺮﻱ ﺍﻳﺠﺎﺩ ﻧﻨﻤﻮﺩﻩ ﻭﻓﻘﻂ ﺩﺭ ﺷﺮﺍﻳﻂ ﻓﺎﺯﻱ ﺗﻌﺮﻳﻒ ﺷﺪﻩ ﺍﻱ کﻪ ﺧﻮﺍﺳﺘﻪ ﺷﺪﻩ ﺍﺳﺖ ﺑﺮ ﺭﻭﻱ ﺷﺒکﻪ ﺗﺮﺍﻓﻴک ﺍﻳﺠﺎﺩ ﻣﻲ کﻨﺪ ﻭ ﺍﺯ Network Utilization ﺑﺎﻻﺗﺮﻱ ﻧﺴﺒﺖ ﺑﻪ ﺭﻭﺵ eager ﺑﺮ ﺧﻮﺭﺩﺍﺭ ﺍﺳﺖ. ﺩﺭ ﺍﻳﻦ ﺭﻭﺵ ﻣﺸکﻞ ﻃﻮﻝ ﻋﻤﺮ ﺍﻃﻼﻋﺎﺕ کﻪ ﺩﺭ ﺭﻭﺵ lazy ﻣﻄﺮﺡ ﺍﺳﺖ ﻭﺟﻮﺩ ﻧﺪﺍﺭﺩ. 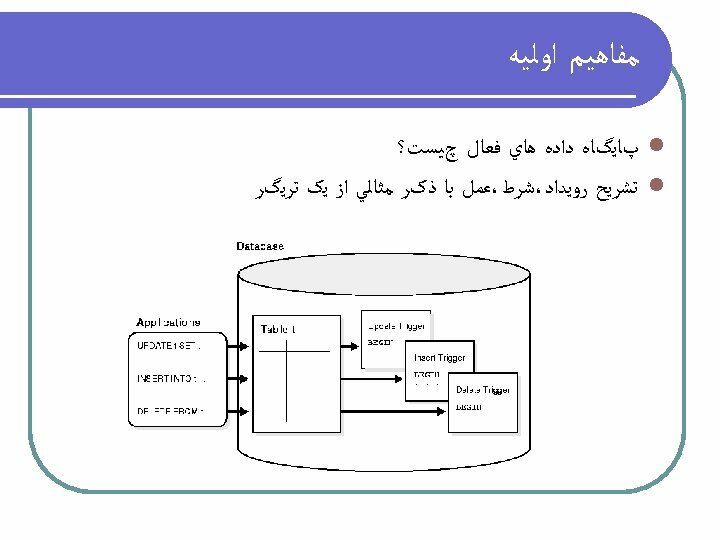 References l l l l  Naghibzadeh, M. Shokrani-Baigi, A. Saadati, N. Fathi, M. Design and implementation of a fuzzy relational database management system applied to osteoporosis patients. in: World Automation Congress, 2002. Proceedings of the 5 th Biannual, Volume: 13, On page(s): 423 - 428, 2002. Dr. Bruce Holenstein, Dr. Bill Highleyman, and Paul J. Holenstein. Breaking the Availability Barrier I - Survivable Systems for Enterprise Computing - Volume 1 of 3 Volume Series, 2007. Christoph Mitasch. Server-Based Wide Area Data Replication for Disaster Recovery, Diplomarbeit an der Fachhochschule Hagenberg, Studiengang Computer- und Mediensicherheit, 2004. M. Wiesmann. 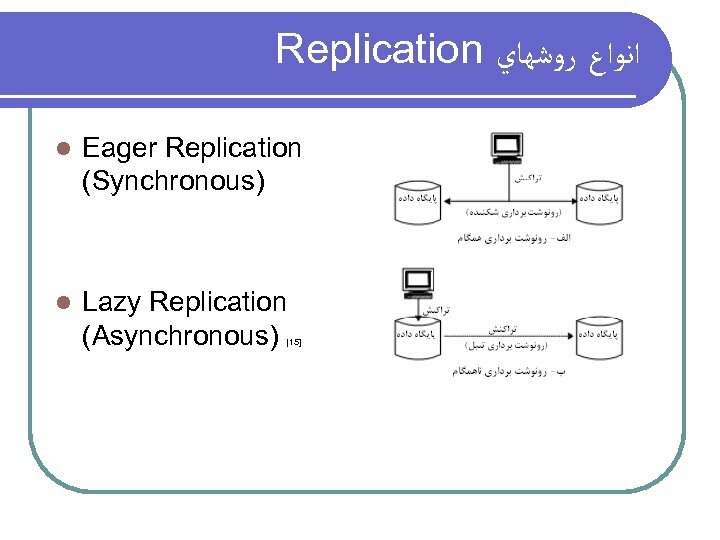 Group Communications and Database Replication: Techniques, Issues and Performance. Ph. D thesis, Ecole Polytechnique Federale de Lausanne, Switzerland, Number 2577. 2002. Y. Saygin, Ö. Ulusoy, Automated Construction of Fuzzy Event Sets and its Application to Active Databases, IEEE Transactions on Fuzzy Systems, vol. 9, no. 3, 2001. Antti Pesonen, Antoni Wolski. Quantified and Temporal Fuzzy Reasoning for Active Monitoring in Rapid. Base. Symposium on Tool Environments and Development Methods for Intelligent Systems, 2000. Antoni Wolski, Jorma Kuha, Tapio Luukkanen, Antti Pesonen. Design of Rapid. 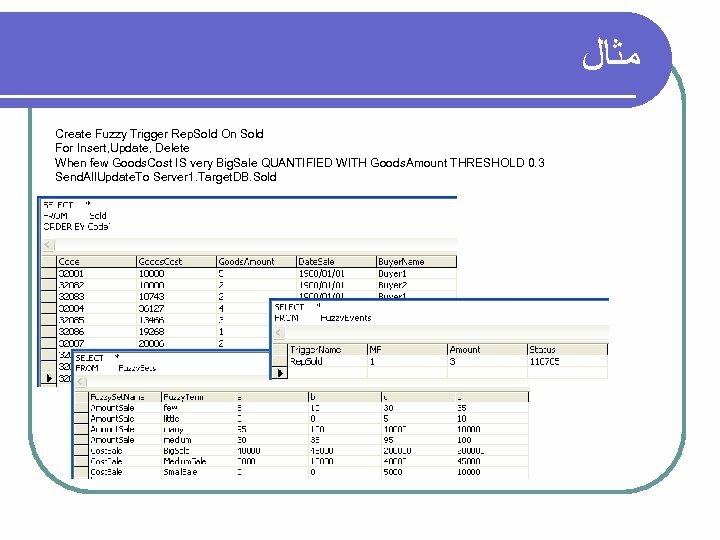 Base an Active Measurement Database System. 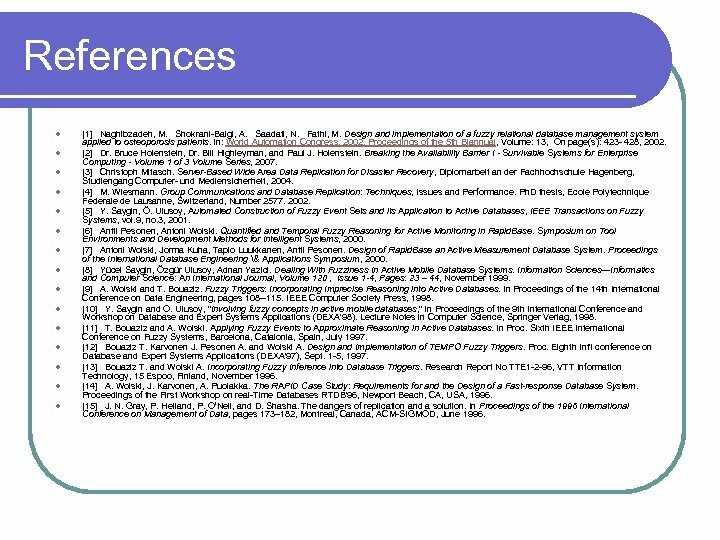 Proceedings of the International Database Engineering & Applications Symposium, 2000. Yücel Saygin, Özgür Ulusoy, Adnan Yazici. 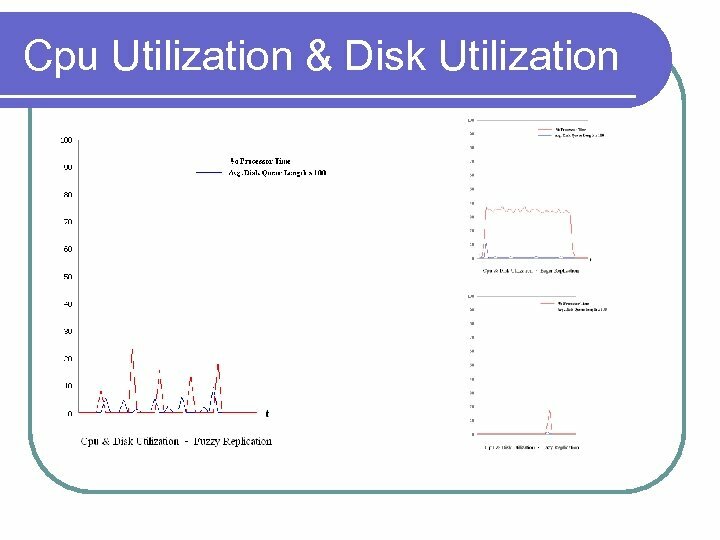 Dealing With Fuzziness In Active Mobile Database Systems. Information Sciences—Informatics and Computer Science: An International Journal, Volume 120 , Issue 1 -4, Pages: 23 – 44, November 1999. A. Wolski and T. Bouaziz. 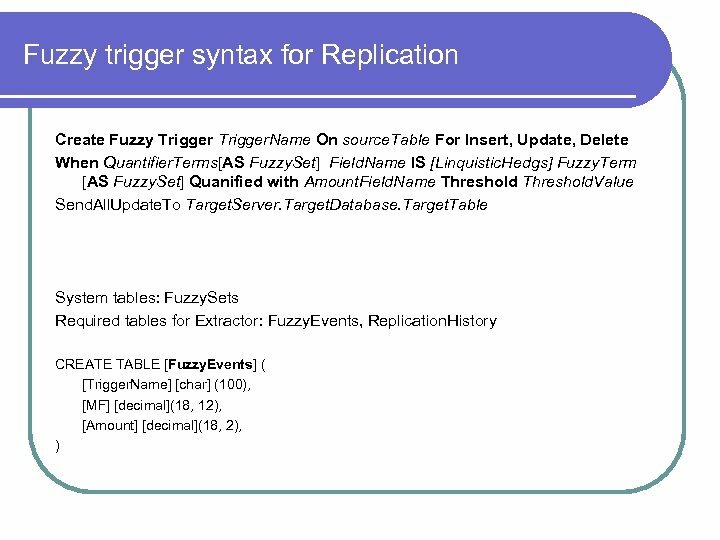 Fuzzy Triggers: Incorporating Imprecise Reasoning into Active Databases. 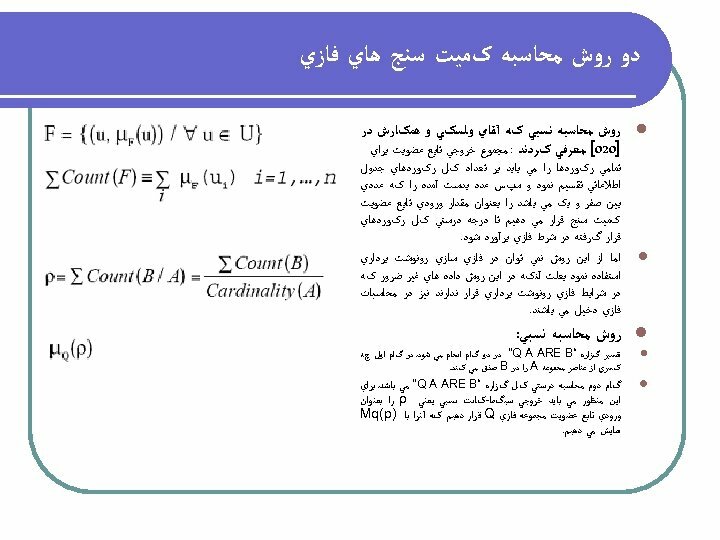 In Proceedings of the 14 th International Conference on Data Engineering, pages 108 --115. IEEE Computer Society Press, 1998. 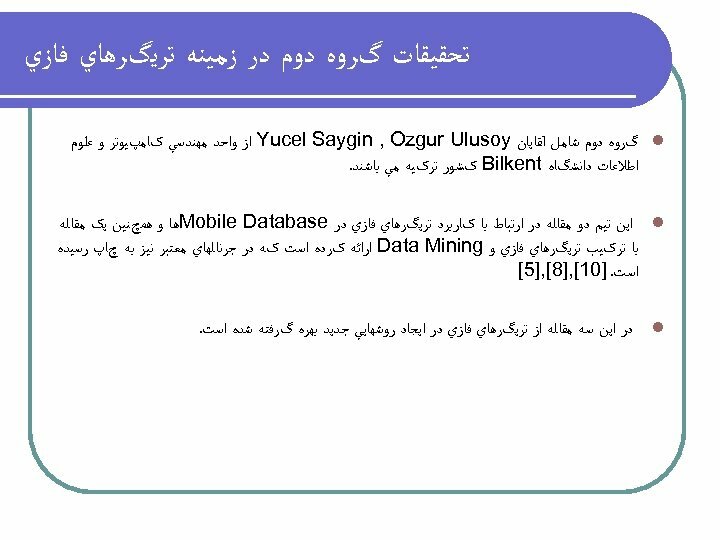 Y. Saygin and O. Ulusoy, "Involving fuzzy concepts in active mobile databases, " in Proceedings of the 9 th International Conference and Workshop on Database and Expert Systems Applications (DEXA'98). Lecture Notes in Computer Science, Springer Verlag, 1998. T. Bouaziz and A. Wolski. 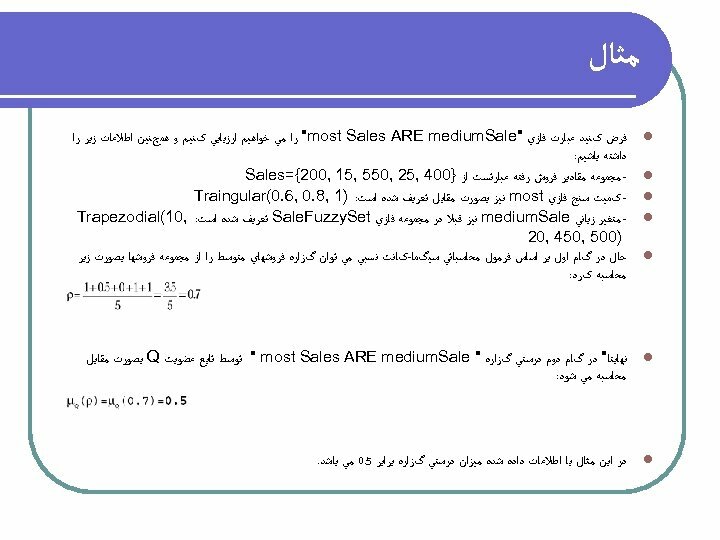 Applying Fuzzy Events to Approximate Reasoning in Active Databases. In Proc. Sixth IEEE International Conference on Fuzzy Systems, Barcelona, Catalonia, Spain, July 1997. Bouaziz T. Karvonen J. Pesonen A. and Wolski A. Design and Implementation of TEMPO Fuzzy Triggers. Proc. Eighth Int'l conference on Database and Expert Systems Applications (DEXA'97), Sept. 1 -5, 1997. Bouaziz T. and Wolski A. 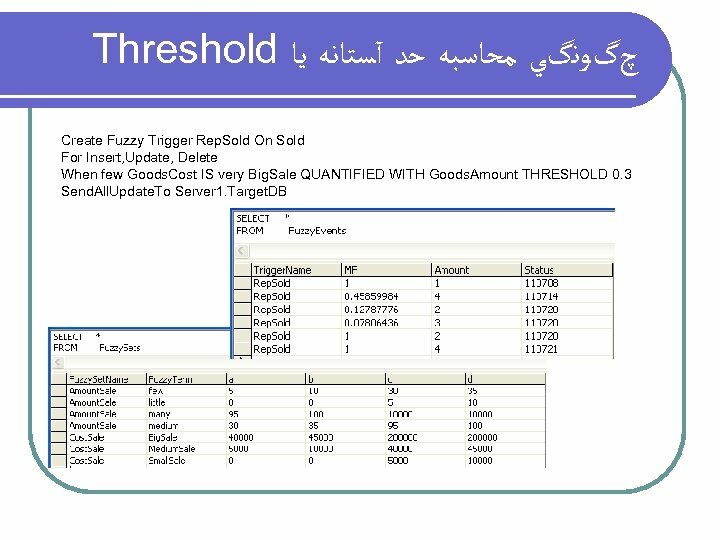 Incorporating Fuzzy Inference into Database Triggers. Research Report No TTE 1 -2 -96, VTT Information Technology, 15 Espoo, Finland, November 1996. A. Wolski, J. Karvonen, A. Puolakka. 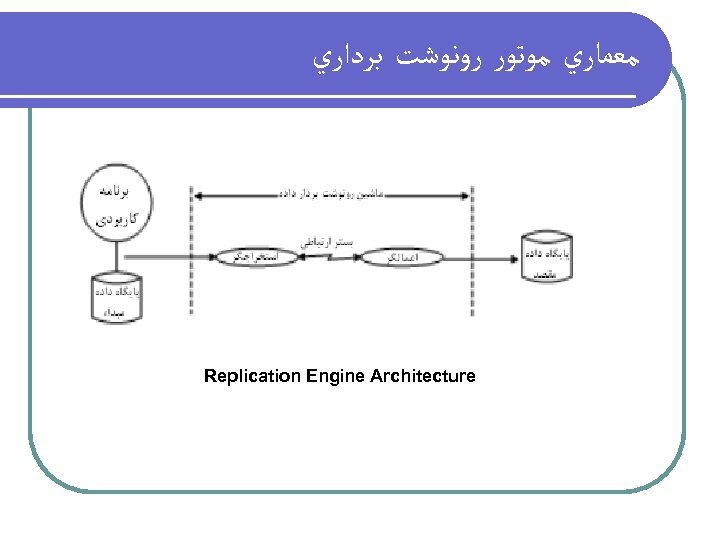 The RAPID Case Study: Requirements for and the Design of a Fast-response Database System. Proceedings of the First Workshop on real-Time Databases RTDB'96, Newport Beach, CA, USA, 1996. J. N. Gray, P. Helland, P. O’Neil, and D. Shasha. The dangers of replication and a solution. In Proceedings of the 1996 International Conference on Management of Data, pages 173– 182, Montreal, Canada, ACM-SIGMOD, June 1996.